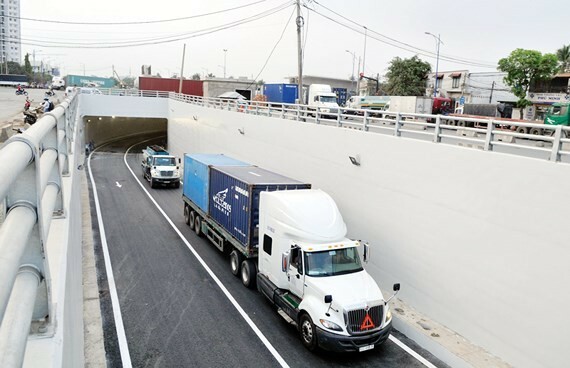 HCMC Department of Transport yesterday opened to traffic the tunnel under My Thuy intersection, District 2 after eight months of construction to ease traffic jam in roads leading to Cat Lai seaport. The 405m long tunnel permits vehicles to travel 40 kilometers an hour. Two and three wheel vehicles are banned from entering the tunnel. 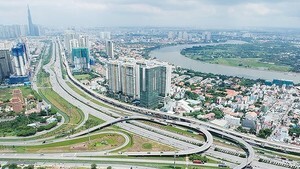 Director of Urban Traffic Management Zone 2 Le Ngoc Hung said that automobiles from HCMC-Long Thanh-Dau Giay expressway can turn left to the tunnel to enter Cat Lai port instead of travelling through My Thuy intersection. Vehicles from Vo Chi Cong street or Ring Road No.2 travel to the tunnel, turn also left to Nguyen Thi Dinh street to reach Cat Lai port. Two nearside lanes of Vo Chi Cong street, from Ky Ha 3 bridge to My Thuy intersection, are for automobiles towards My Thuy intersection, two middle lanes for automobiles to reach the tunnel and two offside lanes for two and three wheel vehicles. The tunnel started construction in June 2016. The first phase has the total investment capital of VND840 billion (US$37 million) from the state budget.